Since I shared a more girly type handpainted border earlier this week, I thought I would share one I did for the boys! I painted this room at the end of last year for one of my favorite clients in their new home. 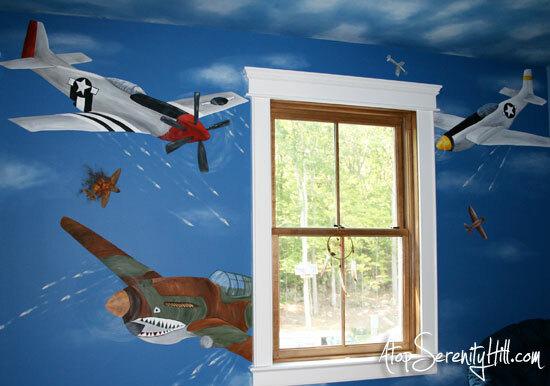 Their son loves fighter planes and requested that his room be filled with them! 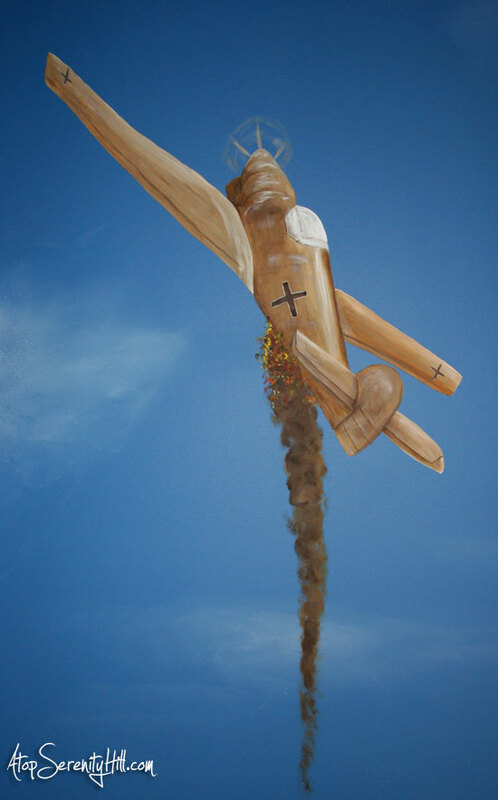 He was very specific about the planes, going so far as to make drawings of his favorite. He made sure at least a couple were on fire and of course, there had to be bullets flying through the air!! 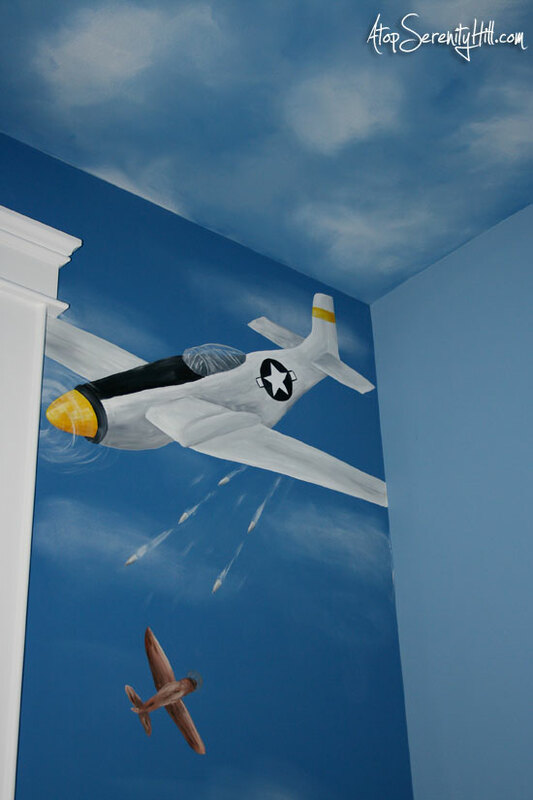 His mom had already painted the room blue, so that made for a great sky background. I enhanced the sky affect by faux finishing his ceiling with clouds. Painting that close to the ceiling with my neck bent backwards made for a very long day! !…but I love the effect when you lie on the floor of the bedroom! Josh thought the room was way cool and it was definitely one of my favorite projects! What themes would you use for a boys room? Do you think it depends on their age? Leave a comment below! Wow!! I wish you were around when I was a kid. I would have loved this on my wall. Great job…one of my favorites. WOW! Amazing job. My 2 year old son would be in heaven. The boy I painted it for was in heaven!! Thanks for visting. AMAZING!!! You must have spent hours and hours creating this art! LOVE IT! Yes, many hours but totally enjoyed it!! Painting murals is definitely one of my happy places! This is so awesome! You were the link before me at the From Dream to Reality link party! This is so great! You did a wonderful job! Thanks, Julia! A fun project to do! Hi Consie! I just wanted to let you know that I featured your wall mural on my blog today! Be sure to swing by and grab a featured button! I just love this! That is so great of you! I am running over now to check it out!! Much thanks! Wow! That’s amazing! You have a wonderful talent! Thanks, Bethany! 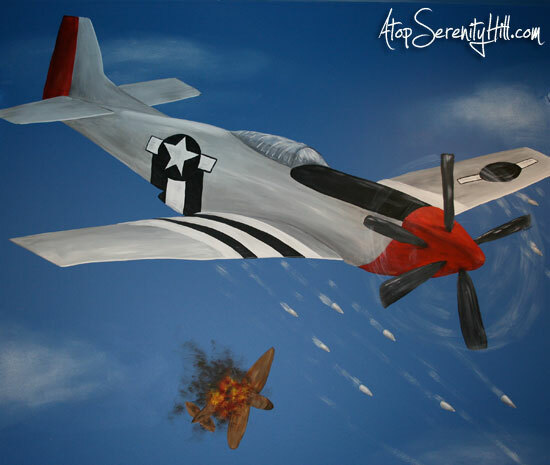 I love to paint murals…just wish I had a few more to do! That is great! 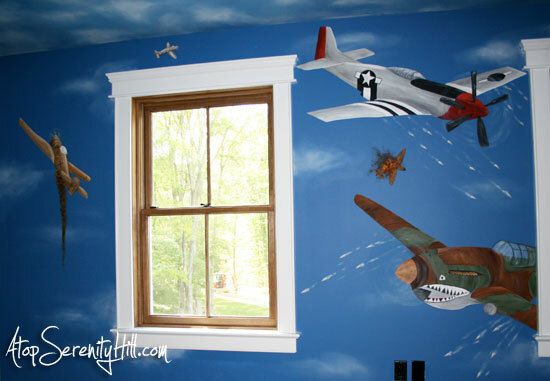 My husband is a pilot and I always envisioned a plane theme room… until we had 2 daughters! Thanks, Carrie. Who knows, maybe one of your girls will end up loving the planes! Visiting from Talkin’ About Thursday link party…this is really amazing! My boys would go nuts over this if I could paint something that nice in their rooms. Awesome!! Thanks, Lisa! You should just give it a go! Start small and work from there! This looks amazing! Coming over from DD&D linky.